Teacher Note: Depending on the length of class time available, this lesson may take 2-3 sessions to complete. Students will describe factors that affect productivity and species distribution in aquatic environments. Watch a video on how human activity and government policy has impacted a river system in British Columbia. Complete a Graphic Organizer while viewing the video. Conduct an investigation on how to save endangered rivers in British Columbia. Students will analyze how federal policies and human activity have affected aquatic systems in British Columbia. Students will identify and analyze alternatives to issues affecting endangered rivers in British Columbia. Students will conduct an investigation on endangered rivers in British Columbia and write proposals for alternative solutions on how to save the respective rivers. Students complete a mind map activity entitled ‘The Many Ways People Use Water’ found in the McGraw-Hill Ryerson textbook BC Science 8 (page 359). While completing the activity, students should focus specifically on what human activities impact river and lake systems. In Canada, there is a plentiful supply of water and we rarely pay attention to how much water we use in our daily lives or how our actions impact local aquatic areas like rivers and lakes. What are the students wondering about how human activity has impacted their local rivers, lakes and oceans? Before viewing the video, students need to understand the meaning of the following terms. Students watch the following video and track their thinking using the Graphic Organizer. Students should try to identify some key effects and implications of federal policy on the Sinixt Nation. Reminder: It is important to stop throughout the story and give students (A/B partners) opportunity to talk or respond to the story. Having viewed the video above, students need to share their ideas from the video Graphic Organizer (A/B partner recommended). Teachers ask student pairs to share their main ideas and generate a list of ideas and evidence on the board or overhead. Teachers lead class discussion on the significance of the ideas generated (and those not generated) and how federal policies have impacted the environment and Aboriginal people on the Columbia River system. Now that students have learned how federal policies and human activity have impacted a regional river system (Columbia River), students will now conduct an investigation on how to save other endangered rivers in British Columbia. Working in A-B partners or groups of four, students conduct an investigation activity found in the McGraw-Hill Ryerson textbook BC Science 8 (pages 444-445). Using the chart provided on page 445 in the textbook, students will choose a local river (or river of their choice) to research and write a proposal to save an endangered river. Student groups report out their proposals to the class in the form of an oral presentation, using either poster boards, written reports, or Powerpoint presentations. Upon completion of the investigation activity, students complete a Reflection Sheet to reflect on what they liked/disliked about the investigation process and how their thinking towards how Canadian Federal Government policy impacts the environment and Aboriginal people has changed. Governments adopting (or not adopting) Kyoto Protocol emission targets. The Canadian federal government imposing a moratorium on seabed oil and gas exploration off the coast of British Columbia. The Canadian federal government policies regarding pollution standards in the Alberta northern Oil Tar Sands. The Kashechewan Reserve water crisis in Northern Ontario. Students can complete a research report on these and other issues affecting the environment and Aboriginal populations in Canada. This entry was posted in Science, Socials and tagged graphic organizer, Investigation, Mind Map, Partner Talk, Proposals, Reflection, Writing on May 4, 2015 by Dan Norman. Students evaluate the human impacts on local ecosystems. Goal: Students will discuss and evaluate the effects that highway construction and vehicle traffic have on local animal populations. Activate Prior Knowledge: With a partner, students complete a T-chart comparing the pros and cons of highway construction. Conduct a class discussion on how the construction of highways affects local animal population and migration patterns. Predict and Question: Ask the students what questions they may still have regarding the construction of highways and the impact on local ecosystems. Predict the most significant effect of local highway construction. Task: Students will demonstrate their understanding of the impact of highway construction on local ecosystems through independent projects. Reminder: It is important to stop throughout the video and give students (A/B partners) the opportunity to talk or respond to the video. Students can track ideas on the T-chart during the video. A/B Partners – Students complete their T-chart sheets and share their ideas with both their partners and class. Students then complete one of the following options to demonstrate their understanding and extend their thinking of how highways and traffic affect local animal populations. Write a letter to the regional government authority detailing the effect of highway construction on local wildlife. Create a poster which takes a position either for or against a proposed new highway being built near the community. Create a television/radio commercial promoting a side for or against a proposed new highway being built near the community. Write a newspaper article which covers the construction of a new highway being built in the community. On the back of their T-chart sheets, students write two new ideas they learned in the discussion around the human impact of highway construction on local animal populations. Students contact their local governmental authority and access an aerial map of their community to select the best location for a new highway corridor. This entry was posted in Science, Socials and tagged drama presentation, Partner Talk, Predict, T-Chart, Writing on April 30, 2015 by Dan Norman. Students describe how societies preserve identity, transmit culture, and adapt to change. Goal: Students will be able to identify the elements of Cowichan First Nations culture that have been preserved since first contact. Task: Students write to explain the challenges faced by First Nations peoples attempting to preserve their culture. Predict and Question: Have students make predictions about the video based on the words and information shared. Give them the title and ask how it has changed their thinking. Questions: What are you wondering? What questions do you have? Reminder: It is important to stop throughout the video and give students (A/B partners) opportunity to talk or respond to the information. Students can track ideas on the T-Chart during the video. A/B Partners – Share elements that have been preserved and have a class sharing of ideas. Model T-Chart on the board/overhead. All ideas should be listed on the left hand side. Discuss with the students how important the described elements are to the Cowichan First Nations people and what other elements have been preserved (i.e textiles, food preservation, etc.). Students record or extend their list of ideas on the T-Chart. Students then, individually or with a partner, brainstorm how those elements were preserved. It is more important for students to have the conversation around possible reasons than to focus on “the right” answer. Students write to explain the challenges faced by First Nations peoples attempting to preserve their culture. The length of this writing piece can be determined the teacher (ie. essay, paragraph) but the intention is for individual accountability. Review which elements of the Cowichan First Nations culture have been preserved since first contact. Reflection: On the back of your T-Chart, write two things you now know about First Nations culture that you didn’t know before. Write one question that you still have about the topic. Research other Aboriginal cultures in Canada (i.e. Cree, Mohawk, Inuit) and investigate what elements of their culture have survived since first contact. This entry was posted in Uncategorized and tagged Brainstorming, Partner Talk, T-Chart, Writing on February 20, 2015 by Dan Norman. Meeka Noelle Morgan, M.A., identifies with her Secwepemc and Nu-Chah-Nuulth heritage, and now resides in Secwepemc territory in the southern interior of BC. Both of her parents were sent to residential schools, but this was never spoken of openly in her home. Throughout her years at public school, she felt that the knowledge and history of her people was not acknowledged or explored adequately or in a meaningful way, which contributed to her feeling very invisible in the scheme of things. Meeka studied the perspective of her parents’ generation on the impacts on families during the 1950’s and 60’s. She wanted to explore how the people in her community maintained their sense of family during this time, especially with the onslaught of residential school. Community and family members told their memories of family life before, during, and after residential school, and reflected on those impacts. Meeka wanted to keep the spirit of each person telling the story in the heart of her research, so she created a verbatim poetic narrative out of each interview, capturing the unique voice and imagery of each storyteller. organize details and information about material they have read, heard, or viewed using a variety of written or graphic forms. identify and explain connections between what they read, hear, and view and their personal ideas and beliefs. use information that they have read, heard, or viewed to develop creative works as response activities. Conduct a discussion on values and complete a Values Inventory. Complete a K-W-L strategy on residential schools. 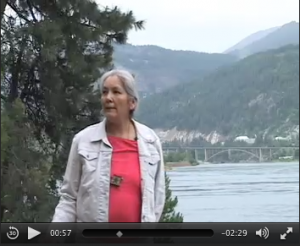 Watch a video narrative on residential schools. Write a poem reflecting on the residential school experience or student values. view/listen to a video about one person’s childhood values and the impact of residential. school on those values. create a poem about their partner’s values to share with the class. Students will identify the impact of the residential school system on a family’s traditional values and create a poetic response by focusing on their own values. How do you know the difference between right and wrong? Do different people have different ideas about what a ‘good’ person is? What does your family teach you about right and wrong? What things are important to your family? How does your family define a ‘good’ person? Do different families have different ideas about what a ‘good’ person is? Will your children have the same values as you do? Could anyone make you change these values? What are some ways people could take these values away from you or your children? Option: use the Values Inventory attached. Once students complete the values inventory, they meet with an A/B partner to compare their responses. Using a K-W-L strategy sheet, ask students to identify what they already know about the residential schools in Canada and the experience of aboriginal people in them. 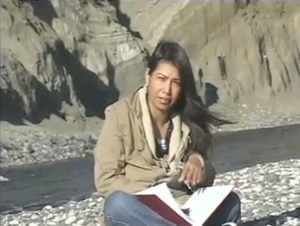 Tell students that they will watch a video clip of a woman who wrote a poem about the way one of her community member’s values changed after going to residential school. Ask the students to predict ways that the person’s values were affected by the experience of residential school. What are they wondering about? Students will listen/watch the clip and use a Placemat strategy to aid comprehension. In small groups, the students create a common response to the video, recording words or images that they find significant. The teacher pauses the video at two key spots to allow students time for this process. First, stop the video just after the speaker talks about restaurants and then talks about the way the grandparents were teachers: “my grandmother / clothed me / taught me the language / in my early life / teachers.” Allow students time to respond to what they have heard so far. Then, tell the students to resume sketching while they listen to Part Two. Continue the video until the majority of the material about the residential school experience has played. The speaker talks about them being hungry and says, “after supper / we would run through those fields / pick whatever we could get stash them / in our shirt / make cache pits / for later.” Pause the video and repeat the above process. Continue the video until the end of the poem, and allow students time to finish their placemat. Conduct a gallery walk so that students can see all the placemats that were created. 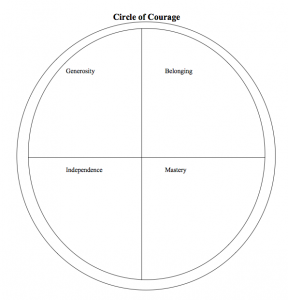 In A/B partners, students will compare the similarities and differences in the values described before residential school/during residential school and after the experience, using a Venn Diagram worksheet. Finally, students return to their K-W-L sheet, identifying what they learned about residential schools during this activity. Option A: Students prepare a poem in response to the experience of listening to the narrative about residential school. This can be a free verse poem, expressing their emotions as they listened to the video. A sample poem, created by Meeka Morgan, represents her response to the difficulty for the people being interviewed, and is included. Option B: With the same or a different partner, students interview each other about their personal values. This activity asks them to return to an individual examination of values with a heightened awareness and broader understanding of their own values and the way they are influenced by society. Students may either develop a list of questions to ask each other, or you may choose to use the initial brainstorming questions above. In either case, A/B partners ask each other questions, taking notes of their partner’s responses. The students will now have a greater sense of self when responding to the questions, and greater depth and an enhanced understanding should be evident in their responses. Finally, each student creates a “Found” poem based on the interview. Note: they are not using their own material: they are using their partner’s responses. Students create a poem (you may choose to require a minimum number of lines), choosing words and phrases from their interview notes that express the underlying values of their partner and the themes he/she revealed in the interview. Students may have poetry readings in small groups or as a whole class. See a possible assessment rubric at the end of the lesson. Students write a reflection about what they felt they did well in this activity and what they found difficult. They could also respond as to whether or not they feel their partner captured the essence of their interview in their found poem. Use the video as part of a larger unit on residential schools in Canada. Students interview a family member or an elder in their community about how their childhood influenced their values, and whether or not those values changed over time. First, discuss what types of questions Meeka Morgan would have asked the people she was interviewing. Develop a list of questions together for the students to ask their guest. If possible, have the students take a photograph of the family member or elder to include when presenting the result of their interview (which could be in the form of an oral presentation or a short written report – if the written report is chosen, be sure to provide a copy to the person interviewed). This lesson is adapted from the assignment “Interview an Elder” in the above-mentioned novel study. This entry was posted in Uncategorized and tagged Critical Listening, Literacy, Oral Language, Place Mat, Poetry, Reflection, Venn Diagram, Writing on February 13, 2015 by Dan Norman. interact and collaborate in pairs, small groups, and large groups to comprehend and respond to a variety of texts. speak and listen to make personal responses to texts, by describing reactions and emotions. read, both collaboratively and independently, to comprehend a variety of literary texts, including poetry in a variety of narrative and lyric forms. read, both collaboratively and independently, to comprehend a variety of literary texts, including student generated material. explain and support personal responses to texts read and viewed, by describing reactions and emotions. write effective imaginative texts to explore ideas, information, and understandings to make connections and develop insights. Read and research various free verse poems. 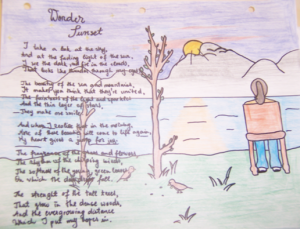 Compare and contrast three free verse poems to three different genre poems. Brainstorm evaluation criteria for student written free verse poems. Create individual free verse poems for presentation in class. develop an understanding of free verse style poetry. 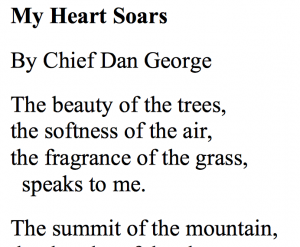 read a variety of Aboriginal poems in the free verse style. create their own free verse poem to present to the class. Students will create their own free verse poem describing themselves and how they relate to their family, school, community, and world around them. 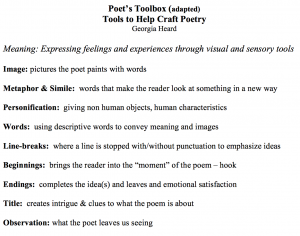 There are many forms and genres of poetry that students may have read (ie.sonnet, haiku, acrostic, cinquain) and each has their own unique structure of language. For the context of this lesson, students will read poems which follow a free verse or lyric free verse form. Teachers ask the students if they have any questions regarding the structure of free verse poetry. What are they wondering about? 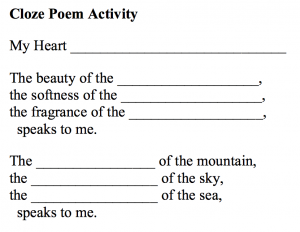 Before students start their writing process to create their own free verse poem, students should read a number of poetry selections to build their awareness of the free verse form. There are a number of different poetry collections available in school libraries and on the internet for students to read. number of words per line. number of syllables per line. number of lines in the poem/stanza. 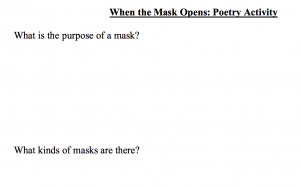 Then, while looking at the second poem in the pair, students try to identify why the second poem is NOT a free verse poem; using the same criteria as listed above. Students use Venn Diagram to record their observations. Once the poem pairs have been compared and contrasted by the students, teachers select three new free verse poems, three new non-free verse poems, and distribute all six poems to each student A-B partner group. Then, the students look at all six poems and attempt to identify which poems are free verse and which poems are not. Student partner groups report out their reasons to the class. Now that the students have a better understanding of the free verse form of poetry, students will create their own free verse poems. Teachers will need to brainstorm with the students the evaluation criteria expected for the finished product (ie. poem length, writing conventions, poetic mood). 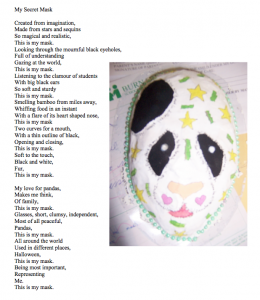 Students can write their poems using a variety of themes. For example, students can create poems that reflect a personal experience, their favourite hobby, social issues, or global issues like global warming. Teachers can brainstorm different topics for students to connect with on the board. 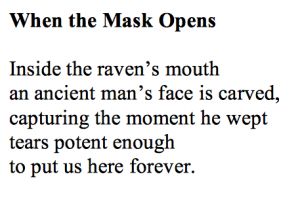 The opening line is repeated at the end of each stanza. There is six lines per stanza. The poems reflect not only the students’ thoughts, hopes, and dreams, but the world around them. Once students have completed their poems, students should present their poems to the class, a small group, or privately to the teacher. Students reflect on their poems and, using either a writing journal or blank sheet of paper, write on what they have learned about the free verse form of poetry. How has their thinking changed? Students build on their poetry writing skills and research/write other poetic forms such as haiku, cinquain, acrostic, etc. This entry was posted in Uncategorized and tagged Brainstorming, Compair and Contrast, Partner Talk, Poetry, Reflection, Writing on January 27, 2015 by Dan Norman. develop personal responses to materials and support their responses with reasons, examples, and details. demonstrate pride and satisfaction in using language to express their thoughts, ideas, and feelings in various written, oral, visual, and electronic forms. Conduct a Place Mat activity on what social responsibility looks like. Watch Raven Tales episode ‘Child or Tears’. Write a journal reflection, create a poster, or drama presentation. Students will develop a better awareness of their personal actions and being socially responsible. Students will write a journal reflection, create a poster, or drama presentation to demonstrate their understanding of what it means to be socially responsible. Students break into groups of two to four students and do a Place Mat activity on what being socially responsible looks like (ie. showing respect, accepting other ideas). If their school has some schoolwide themes on social responsiblity, teachers should try to highlight them in the discussion. Teacher explains to the students they will be watching a video of Raven Tales called ‘Child of Tears’. Ask the students to predict, given the title of the video, what the story will be about? What are the students wondering? Viewing Notes: Depending on the class or teacher preference, students can either watch the video completely through and then discuss, or the teacher can stop throughout the story and give students (A/B partners) opportunity to talk or respond to the story. Once the video has been viewed, student groups review their Place Mats and, with a highlighter, highlight words and connections they feel were represented in the Raven Tales episode. Students write a journal reflection on what it means to be socially responsible in a school setting or in their local community. One possibility for reflection is students can give an example of an event in their lives when they took responsibility for their actions or, in contrast, avoided responsibility and regretted their decision. Students create a drama presentation that focuses on the social responsibility themes identified in the Raven Tales episode. A written script should be created and, once completed, students present their drama creation in class or at a school assembly. Students create a poster for display in their school. The poster should contain a message and images of how to act socially responsible in school and in their community. Themes for the posters should derive from themes identified in the Raven Tales episode. What did I like/dislike about the Raven Tales episode Child of Tears? Has my thinking changed about being socially responsible in my school, home, and community? How? Why? Why not? Students develop a personal action plan on how to be more socially responsible in their personal lives. The action plan can consist of a weekly/monthly plan where students monitor their actions and evaluate them according their action plan goals. This entry was posted in Uncategorized and tagged drama presentation, Journal, Place Mat, Predict, visual representations, Writing on January 22, 2015 by Dan Norman. 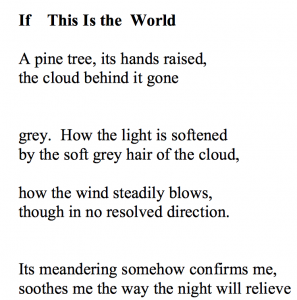 The resources on this page support the following poems. This entry was posted in English, Socials and tagged Critical Listening, Literacy, Poetry, visual representations, Writing on October 29, 2014 by Dan Norman. 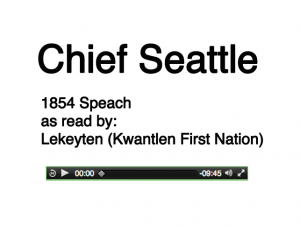 Listen to an audio recording of a speech by Chief Seattle. Discuss main ideas of the speech with a class brainstorm. Preview a list of phrases from a video presentation. 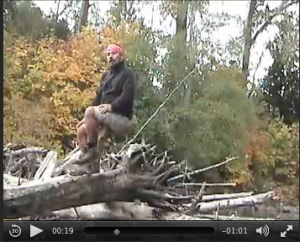 Watch a video on Salmon Stewardship in the Fraser River. Research articles and conduct a Jigsaw Instructional Activity. Complete a Thinking Yes/Thinking No activity on an issue concerning the Fraser River. Create a piece of written text about the importance of taking care of the environment. Students will gain an understanding of stewardship through an Aboriginal World View. Students will write a piece of written text (journal reflection, letter, poem, speech) which sends a message to others about the importance of taking care of our environment. For more information on Chief Seattle’s speech, please visit the HistoryLink.org website. 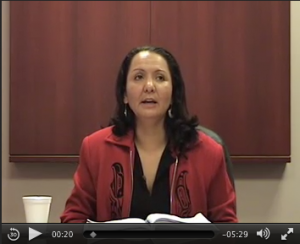 Note: This audio recording is used with permission from the Kwantlen Nation and is to be used solely for the purpose of the Aboriginal Curriculum Integration Project. While listening to the audio recording, students track their thinking and highlight five key points from the speech using a What’s Important and Why sheet. 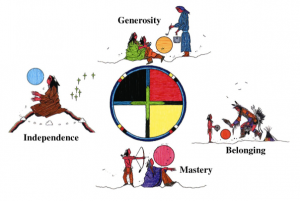 Questions students should consider include: What is Chief Seattle’s message? What were his concerns? Reminder: It is important to stop throughout the recording and give students (A/B partners) opportunity to talk or respond to the audio. Once the audio recording has been played through and students have completed their What’s Important and Why sheets, students compare their thoughts in A/B partners and then report to the whole class. Teachers can then highlight key class ideas and themes with a brainstorm on the board. Students will now watch a video presented by Lekeyten of the Kwantlen First Nation. Teachers distribute a list of phrases from Lekeyten’s presentation. In A/B partners or small groups, students read the phrases and share their predictions about what themes will be presented in the video. Ask the students what questions they may have about environmental stewardship and the stewardship of salmon species. What are they wondering about? Distribute a second What’s Important and Why sheet for the students to track their thinking and identify five important facts from the following video on salmon stewardship. Reminder: It is important to stop throughout the video and give students (A/B partners) opportunity to talk or respond to the video. Break students into groups of five. Teachers print out and distribute information from the following links. Once students have completed the Jigsaw strategy, using the new information they have just learned, they complete a Thinking Yes/Thinking No sheet considering the question “Are human actions solely to blame for disappearance of Fraser River salmon?”. Students should write information showing both sides of the question on their Thinking Yes/Thinking No sheet. – What ever befalls the earth befalls the sons and daughters of the earth. – This we know. The Earth does not belong to us, we belong to the earth. – We did not weave the web of life, we are merely a strand in it. Whatever we do to the earth we do to ourselves. On the back of their ‘What’s Important and Why’ sheets, in a journal, or on a separate piece of paper, students write a reflection on how their attitude towards salmon stewardship and environmental stewardship has changed. What ideas presented in the audio and video recordings impacted their thinking the most? Invite visitors from local environmental groups to discuss human impacts on local lakes, rivers, and tributaries. If this isn’t possible, students locate and present articles that demonstrate local, regional, or national initiatives which help the environment. This entry was posted in Uncategorized and tagged Jigsaw, Literacy, Writing on March 28, 2014 by Dan Norman. Students will assess the impact of the fur trade on exploration and settlement. Conduct a Jigsaw Activity with four articles on the fur trade. Watch a video on the impact the beaver had on the development of Canada. Complete a Four Quad graphic organizer while viewing the video. Play a ‘Chocolate Game’ to develop understanding of modern trade practices. Write a reflection on the Fur Trade and modern trade practices. identify the main factors leading to the development of the North American fur trade. relate the elements of the North American Fur Trade to the modern global trade economy. Students play “The Chocolate Game”, a game which hilights the disparities in world trade, and write a reflection on the process. Once the students have reported back to their ‘home’ groups in the Jigsaw activity, students record their thoughts for each article on a What’s Important and Why sheet. The students will now watch a video on how the beaver impacted the development of Canada from a Métis perspective. Have students make predictions about the video based on the articles they have read. What are they wondering about? What questions do they have? Reminder: It is important to stop throughout the video and give students (A/B partners) opportunity to talk or respond to the information. Students can track ideas on a Four Quad note sheet during the video. The Hudson’s Bay Company was one of the world’s first multinational companies that extracted resources from a foreign land and turned those resources into high profit status goods for sale in their home country. There are many modern examples of multinational corporations which continue the practice of resource extraction in foreign countries and converting those resources into high profit status goods in their domestic economies. Teacher brainstorms on the board examples of modern multinational corporations (ie. Nike, The Gap) and the products they create. For further understanding of how wealth is distributed from countries supplying resources to multinational corporations, students play ‘The Chocolate Game’ located at the People and Planet.org website. Students write to explain their thoughts and opinions on the Fur Trade, the Hudson’s Bay Company, and the practice of multinational corporations in the 21st century. The length of this writing piece can be determined the teacher (ie. essay, paragraph) but the intention is for individual accountability. On the back of their What’s Important and Why sheet, students write two things they now know about the Fur Trade that you didn’t know before. Students then write one question they still have about the topic. This entry was posted in Uncategorized and tagged Jigsaw, Literacy, Writing on February 14, 2014 by Dan Norman. Students use writing and representing to critique, express personal responses and relevant opinions, and respond to experiences and texts. Introduce a graphic organizer (Four Quad). Record and discuss key vocabulary on the graphic organizer. Create a web identifying examples of teenage labelling. View a on video on Labelling. Students will create a written response (journal reflection, poem, or song) to express their personal opinions about labelling/stereotyping. Distribute Four Quad graphic organizer. Discuss the following key vocabulary: Aboriginal, politically correct, exotic, ‘Garden of Eden’, caribbean, ‘Los in Dios’, Indian, Hindu, Hindustan. (Definitions) Students record the vocabulary in the first quadrant of their graphic organizer. Teachers ask students to identify what other stereotypes exist in society (for examples, view the following link on Media Stereotyping) and in schools. Brainstorm ideas on the board. Ask students to think about their own personal label – what group do they identify with? Using A/B partners to share their thinking, students create their own web on teenage labelling in quadrant two of their graphic organizer. Students view the following video Labelled and track their thinking in the third quadrant of their graphic organizer. They should record key words, phrases, and interesting ideas. Students respond to the class discussion and video by writing either a journal reflection, narrative story, non-fiction work, poem, or song that focuses on the issue of Labelled. The Four Quad graphic organizer can be used as a source for writing ideas. Students write on the back of their graphic organizer one new idea they learned about themselves, one new idea they learned about another person in class, and their own definition about labelling. Interview people from other cultural backgrounds and learn about their experiences with labelling and stereotyping. This entry was posted in Uncategorized and tagged Literacy, Writing on February 14, 2014 by Dan Norman.